The success of the revolution in Rojava and its political practices have presented international revolutionaries with a unique situation, one many of us didn’t know we could hope for in our lifetimes. This opportunity has not only revitalized those fighting oppression around the world, but also raised the important question: how do revolutionaries in their own cities relate with it. We at Rojava Solidarity NYC, would like to offer a proposal. Rojava, an autonomous region in Northern Syrian, the largest revolutionary territory of the 21st century, has projected anarchist and communist ideas to the forefront of political discourse and into the pragmatic and messy reality of everyday life. 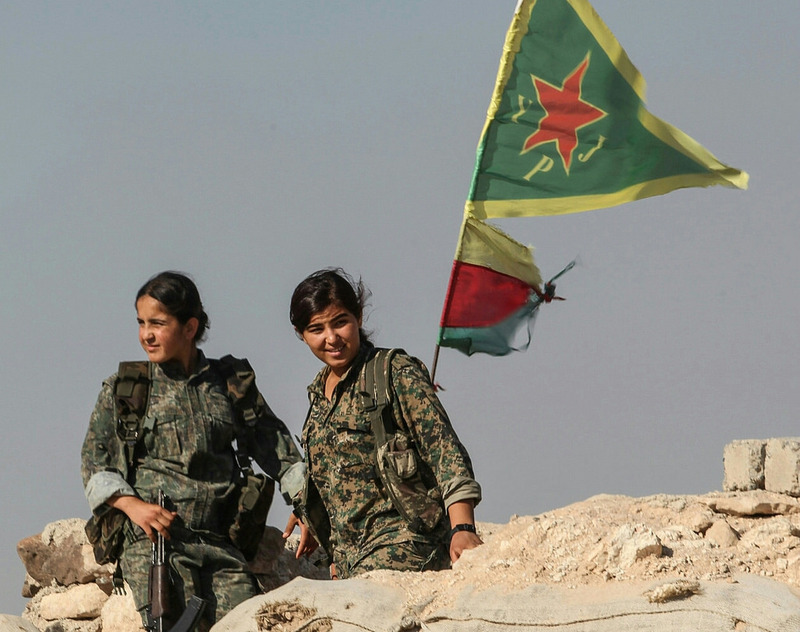 The revolution’s political foundation, democratic confederalism, is an amalgamation of anarchist, communist, and feminists practices, with a focus on ecology and profoundly rooted in the Kurdish liberation struggle. Rojava has been fighting for survival against Daesh (ISIS), while simultaneously rejecting the state formation and implementing decentralized self-governance. For revolutionaries who have not had the chance to witness such massive revolutionary gains as in Rojava, this is a development many thought impossible in their lifetimes. Historical revolutionary situations from Spain to the Ukraine demonstrated examples of projects either crushed or squeezed to the point where they didn’t have any more influence. Krongreya Star, the PYD, TEV-DEM, YPG, and YPJ’s forms of political organization – political bodies that espouse liberatory politics – have succeeded in being the predominant ones in society. Their political and strategic vision has outmaneuvered and consolidated revolutionary gains that many other movements have failed to achieve. As revolutionaries, we are actively engaged in struggling against hegemonic forms of power and building towards new forms of organization. The success and widespread nature of Rojava is indispensable for our learning process. From communal relationships to the councils and self-defense units, we can assess numerous potential routes by which we can create liberated communities at home, while learning from their possibilities and pitfalls. For groups struggling inside one of the most imperial and brutally capitalistic states, a large part of our work is convincing our neighbors that self-governance works. Often during the course of a project, people new to our politics have been skeptical of the practicality of anarchism, decentralized decision making, and anti-state organizing. We have been able to explain how these attributes function in Rojava, which, in turn, makes our organizing goals more attainable in their eyes. Rojava’s decentralized model exemplifies what is possible today, and how people can begin establishing these revolutionary processes in their communities. Every revolution struggles with how to deal with counter-revolutionary elements. The Rojava revolution has dealt reasonably, yet uncompromisingly, with political opponents. They have also been able to keep the objectives of nation-states in flux, despite their continuous attempts to harness Rojava’s resources. Instead, they have been able to leverage the political objectives of other states in order to maintain territorial and revolutionary gains. These are essential lessons for all revolutionaries. A false binary has been presented by academics and well-meaning revolutionaries. They argue one can either be a ‘mindless cheerleader’ or engage in what is called ‘critical solidarity.’ By this formulation, the correct way to engage with Rojava, and to some degree all revolutionary projects, is to analyze which aspects we disapprove of and vocally denounce these attributes – ones that presumably don’t line up with our ideologies. The first problem is that the concept of ’critical solidarity’ attempts to homogenize the region and pretend that it could be evaluated as a uniform entity. If someone is critical of ‘Rojava,’ it reinforces the framework of evaluating a people in the top-down terms of a nation-state rather than a specific commune, region, or group. This practice denies the self-defining nature of disparate groups that comprise society, denies the ground-up organizing structure of the commune, and denies the very basis of self-governance. Essentially it eats away at the very heart of the revolutionary aspects of society we are trying to affirm. The most devastating effect is that these public denouncements have been exploited by political opponents of the revolutionary project. While Rojava is under attack by ISIS, it also faces shelling, assassination, and embargo by Turkey, and opposition from the Syrian government and the ‘Free Syrian Army.’ The reactionary forces that don’t want to see a liberated region on their borders or, for example, the self-liberation of women, are eager to use the fissures between leftists in the West to undermine support for Rojava. Further criticism is leveled against the political bodies and militias that defend and spread the revolution. Such criticism, typically from people who are poorly informed, is in effect, unequivocally counter-revolutionary. Those critics, rather than informing themselves of the revolutionary process, learning about the groups on the ground, the militia movement, or the fluidity and openness of the project, have taken it upon themselves to undermine a fragile movement when it is most important to buttress its gains. For once, a revolutionary territory has been established with calls for expansion around the globe and for revolutionary assistance, and arm chair actors decide to fight back against it with the pen instead of strategizing about how to march forward together. These critics should be thoroughly dismissed. Finally, and most obviously, the absence of public critique does not equate mindlessness. Quite the opposite is true. As political actors we are more mindful of the conditions that lead to decentralization, and the expansion of revolutionary gains, and we must put our assistance and advocacy to work for those with same goals as us. The most liberatory aspects of society, such as the communes and feminist organizations, are projects we must develop relationships with. As this struggle unfolds at this very moment, there is an active opportunity to aid each other’s successes. While there are several inherent flaws with the notion of ‘critical solidarity,’ the most egregious problem is that it does not acknowledge the most important type of engagement: revolutionary solidarity. 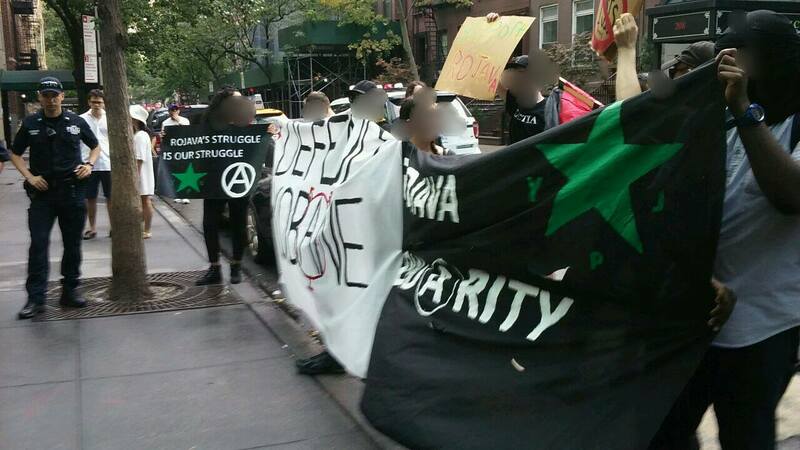 The connections between small revolutionary groups in different cities rely on the conception that we are part of a shared struggle. We share knowledge, resources, and help propel each others’ objectives, building infrastructure and networks outside state and capitalist relations. The same applies to a region deeply engaged in a revolution. The notion of ‘solidarity’ itself is perhaps too weak a term to express the relationship between nascent revolutionary groups and a region already practicing and experimenting with revolutionary social organization. In the most concrete terms, as friends and comrades travel to the region, even sometimes giving their lives for its success, our missions become intertwined. It is our view that the best and most important criticality should be reserved for implementing the struggle in our neighborhoods. We look at how things work in Rojava, make connections with people who are implementing these social practices, learn from them, and evaluate how best they will play out in our own struggles. This is where criticality makes sense. How should these practices be introduced? How can they be most effective here? What practices allow for the most self-direction and participation? This is the very method of self-criticism and reflection practiced within every revolutionary organization in Rojava. In fact, if it hadn’t been so integral, it may never had pivoted over from a Marxist-Leninist struggle to an anarchist-inspired one. A new way for relating with a decentralized society is necessary, both for appropriately acknowledging the people’s self-governance, but also for the work of propagating and reinforcing people as people, rather than subjects behind a centralized governing body. Groups, such as the women’s organization Kongreya Star or the youth networks, reach out to other such groups around the world, cutting through the unnecessary bureaucracy artificially erected by national borders. Connecting on the basis of interest, identity, and shared revolutionary intentions is an essential way for building movements across borders and undermining the hegemony of nation-states. As the rise of the far right around the globe threatens to destabilize civil society in it’s turbulent battle for power and exclusionary violence, the more important it becomes to push forward revolutionary solutions around the globe. The more successes anti-authoritarians have on a local level, drawing more power towards the ground, the less power imperialist states can wield and the less momentum fascist tendencies will have. Many reactionary forces would not like to see the social project in Rojava succeed. Accelerating the struggle back home helps undermine the international reach of nation-states, and the fascist forces they breed. The rise of liberatory social movements simultaneously around the world helps ensure the longevity of all. As international revolutionaries, the borders that separate our landmasses, the languages we were born into, the history of our respective areas are not unbreachable differences that separate us, but things either to be overcome, or understood, in order to push the struggle forward together. Presently international anarchists, socialists, and communist revolutionaries are actively involved in the struggle in Rojava. They are involved at the civic level, participate in the militias, write reports for those back home, and deliver supplies. At very least there is an alliance between such actors abroad and at home. By traveling to a dangerous location, often to put their lives at risk by participating in combat, these comrades have shown their commitment to the project. When these fighters return home, they will be able to put their knowledge to use, to help further the struggles there. We propose revolutionary solidarity as the ideal way to engage with the social experiment in Rojava, the new revolutionary paradigm of the 21st century. New Article, Project, and Resources! We recently added some new resources for local committees and individuals looking for creative ways to introduce others to the Rojava Revolution. They range from ready-made poster files to a complete zine and can be taken as they are or used as inspiration for something new! Check them out here. Also, we have been in contact with a great group that has developed a new way to show solidarity with some of those affected most by the Syrian Civil War – displaced families. The American Kurdish Association (AKA) started the Sibling Family Project in April 2016, which helps families in Europe and America sponsor Kurdish families that are in dire need of support. To learn more, visit our updated Solidarity section here. Lastly, LeftEast has published a new article of ours that provides some much needed context for Turkey’s most recent attack on Rojava, which has included a direct invasion of the region and a slew of political games to force the YPG out of recently liberated areas west of the Euphrates river. In a sea of Western media coverage that consistently reduces the Rojava Revolution and its ideals of feminism, confederalism, and ecology to the term ‘Syrian Kurds’, the article fills a severe void of information, even giving a nuanced history of the Democratic Union Party (PYD) and an explanation of how it’s become Erdoğan’s public enemy #1. The article is printed below in full; however, to view it in its original form, visit LeftEast’s publishing of it here. In case you missed it, last September we were featured in Strike Magazine! Check out the issue here! This September we spoke with CrimethInc about the Rojava Revolution in the fiftieth episode of their podcast. The discussion spanned several topics, from commemoration of the American anarchist Jordan MacTaggart, who joined the YPG and was killed during the liberation of Manbij, to the politics of martyrdom within the anarchist movement. It was a great discussion, be sure to check it out! 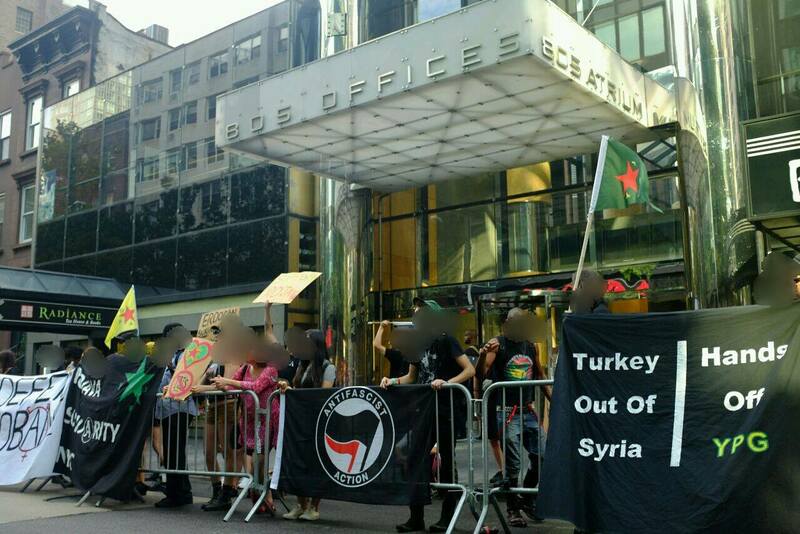 Also, on September tenth we held a demo at the Turkish consulate in NYC as an immediate and direct response to Turkey’s invasion of N. Syria. As usual and not unlike their savior Erdoğan, the consulate members attempted to bully and intimidate those that showed up to demonstrate against their totalitarian state and its incessant chauvinism. 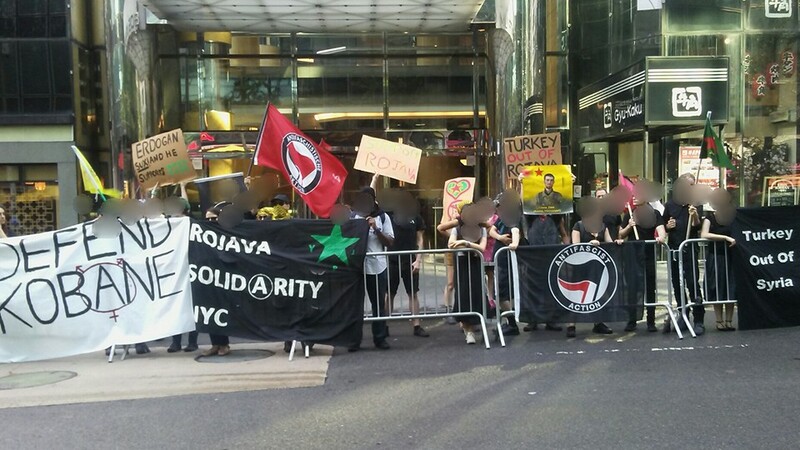 However, all comrades stood their ground and made their voices heard, with chants such as ‘Bijî Rojava!’ and banners that read ‘Turkey out of Syria’. Below is the press release and some pictures from the event. New York, New York – Dozens, perhaps hundreds, of people will rally Saturday at the Turkish consulate to demonstrate their outrage at the latest military aggression in Kurdistan, particularly the deadly Turkish attacks on the democratic revolution in Rojava, a region of Syria. Last week Turkey began cross border operations in Syria—bombing, shelling, and assaulting the Syrian Democratic Forces (SDF) and People’s Protection Units (YPG/YPJ). 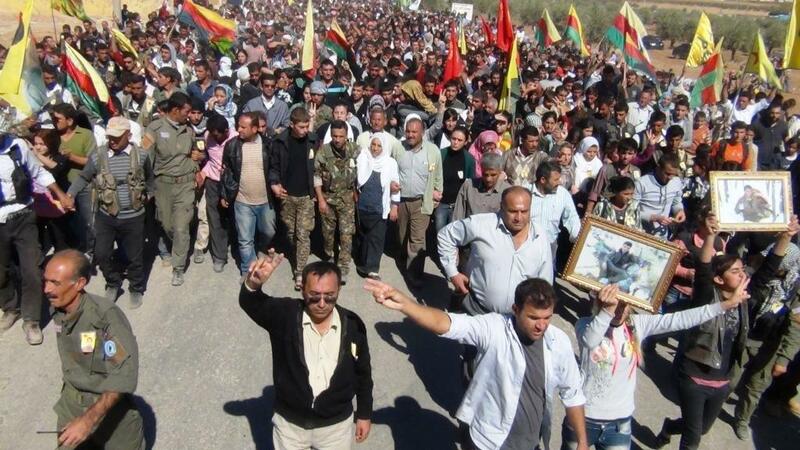 In the city of Kobane, two peaceful demonstrators were killed by Turkish forces firing across the border. While Turkey claims to be fighting terrorists in the form of ISIS, their real objective is to strangle the autonomous, pluralistic, and feminist revolution which has been taking place in the predominantly Kurdish area of northern Syria known as Rojava. This revolution stands in stark opposition to the Islamist, authoritarian, and misogynistic tendencies of both Turkey, and the factions in the Syrian War associated with it. The international community must support Rojava in the face of this aggression, lest the best hope for freedom and democracy in the region will be destroyed. The United States government in particular has been complicit in this blatant betrayal of their allies in Rojava, who have been the only consistent leaders in the fight against ISIS (Daesh). ISIS won’t be stopped by a foreign ground invasion any more than the Taliban (who still haunt Afghanistan) have. Fundamentalist terror can only be stopped by an indigenous movement that offers an inspiring alternative. The authoritarianism of the Turkish state cannot inspire the people of Syria, but the participatory democracy of Rojava can.